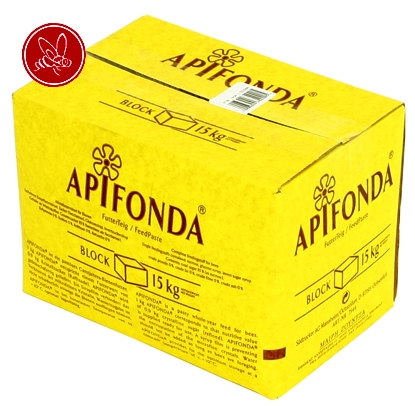 Last week I ordered 2 boxes of ApiFonda 15 kilograms each. Now the guy I bought my bees from said he used this as well. He even showed me how he puts the box right on top of the frames. I didn't think anything of this because even the company's website I bought it from shows them putting the full box right on top of the frames. As I was putting it on I was thinking to myself how the am I going to get this off again to check the hives. I haven't tried ApiFonda before it seamed very gooey. But I plopped it down anyway, probably killing a few bees in the process 15 kilograms is heavy. Last night after work Ole came over he his a very nice man from my local bee school hes in his 70's and has had bees for over 18 years. He came over to mark my queens for me, I'm to worried about hurting the queen to do it myself next summer I'm going to practice on drones. When he saw what I had done with the two boxes he was shocked. He had never seen it done like that before. He told me how they normally cut off a chunk that's around 1 kilogram and put that on top under some plastic. It took us about 5 minutes to figure out how to get it off. Ole was stung on the hands a few times he doesn't where gloves and the girls where not all that happy about the huge sticky box being removed. Even the frames where stuck to this mess..... Yuck! To make a long story short we managed to remove the boxes from both the hives. We only found one of the queens but at least shes marked now. He says I'm doing everything right (with the exception of boxes on the hives) that they are both very strong happy bee families. Both queens are laying well and they still need more stores for the winter, he told me to feed them more sugar syrup and to put 1 kilogram of that stuff back on at a time. Last night I took two sheets of wax paper and put the Fonda between them and rolled it out to about 2 cm thick. 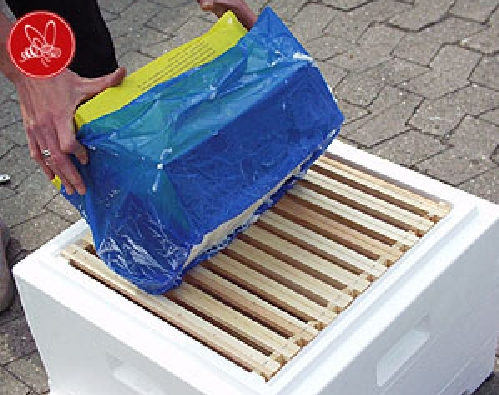 I cut the wax paper to shape and put that on the hives. The bees will be able to get to it though the sides of my little Fonda pancake, and it will keep sticky gooey mess off the frames. Stung for the first time. Feeding Time / Honey Tasting. Life Cycle of the Honey Bee.